Stradbroke is perhaps the least well-known of Suffolk's small towns. But it has a busy, independent air, with its shops, school, library and leisure centre. It reminds me of places of a similar size in France. The church is in the centre of town, a large, imposing building. The 15th century tower, with its raised stair turret, is visible from miles away. Niches flank the west window, other windows build via a bell window to high battlements. It is one of Suffolk's biggest towers, probably because this was the parish of the De La Poles, now sleeping peacefully at Wingfield. Simon Cotton found a bequest for a new bell in 1428, which usually followed hot on the heels of a new tower, so is probably a good date. All Saints is open every day, and you get the impression that people wandering around are just as likely to be locals availing themselves of a spot of spiritual refreshment as visiting pilgrims and strangers, which is nice. It is a most welcoming interior. The vicar in the second half of the 19th century was the formidable J.C. Ryle, the famous protestant evangelical. He had an enthusiasm for plastering any available space with quotations from the Bible. His are the near- Soviet era banner slogans at Helmingham, designed to keep any Tractarian tendency of the Tollemaches in its place. Here, his work is rather more subtle and aesthetically quiet, on the chancel arch and roofbeams. They were painted as part of a major restoration of the 1870s. The architect was R.M. Phipson, fresh from his complete rebuilding of Ipswich St Mary le Tower; this church is on a similar scale, although the exterior is pretty much intact, apart from a thorough refurbishment. Below the tower, there is a dramatic picture of the interior during this restoration, a reminder of just how drastic some of these makeovers were. Ryle and Phipson reduced All Saints to a gaping shell. Consequently, not much survives of the medieval liturgical integrity, except the font, which was considerably recut but still retains its dedicatory inscription, and an amazing niche in the sanctuary. Mortlock feels it was probably an Easter sepulchre, but I don't see why it can't just have been a niche. Another medieval survival is a pair of rood screen panels in the chancel. They may not have come from this church originally: they depict two Old Testament Kings, of whom Ryle would approved, and may have been purchased and installed here as part of the restoration. They are, not inappropriately, very heavily restored themselves. The Clayton & Bell glass in the east window was installed at Ryle's behest, depicting a pulpit and a lectern alongside a font as a reminder to the Stradbroke faithful that the Word was at least as important as the sacraments, if not more so. The glass at the west end is better, I think, including a memorial window to Queen Victoria and some beautiful depictions of roses, lilies, wheat and grapes by the O'Connor Brothers beneath the tower. Other points of interest include a large number of ledger stones at the west end of the nave. One is to two parents, who both died at the age of 25, leaving two infants too young to be sensible of their loss. The altar frontal and hangings in the south aisle chapel, beautiful designs of wild flowers apparently worked by a one-armed curate, are a delightful contrast with the stern puritanism of J.C. Ryle's chancel. 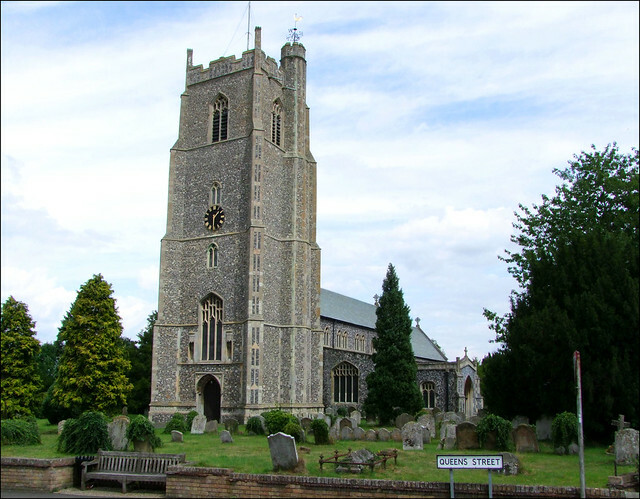 Stradbroke is one of a handful of churches in East Anglia to have a royal arms to the current monarch. Stradbroke's most famous son was the ruthless opportunist Robert Grosseteste, Bishop of Lincoln in the 13th century. He was lionised after the Reformation for, supposedly, standing up to the Pope; in fact, he aligned his diocese with the Barons rather than the King, and thus creamed off money that would have gone to Rome via the Crown. He became fabulously rich, as did his crony Simon De Montford, who led the landed nobles against Henry III in the Barons' War. Barmy old Arthur Mee, in his The King's England, treats Grosseteste as some sort of all-round Great Englishman and proto-Protestant hero. The church that Grosseteste knew, and was baptised in, was not this one, but was probably on the same site. In the 1880s, J. C. Ryle left here to become first Anglican Bishop of Liverpool, but the mark of his Muscular sleeves-rolled-up Christianity survives here. Also does his name on a brass plaque beneath the tower, noting him as one of the benefactors of the restoration.